The hope that carbon capture and storage (CCS) can ever play a significant role in the reduction of power sector emissions is misplaced, write Jeffrey Rissman and Robbie Orvis of Energy Innovation, a San Francisco-based energy and environmental policy think tank. Coal-fired power is already more expensive than unsubsidized onshore wind and solar PV. Adding CCS will only increase this gap. The subsidies required to bring CCS costs in line with solar and wind are staggering. The electric power sector accounts for 29 percent of the United States’ greenhouse gas (GHG) emissions, and electricity demand is expected to increasebetween now and 2050, making GHG emissions reductions from our electricity system one of the most promising ways to address climate change. While many technologies can reduce power sector emissions, carbon capture and storage (CCS) has gained support in Congress, most recently through a proposed extension of federal tax credits supporting coal plants – but CCS is the most expensive option available. Energy Innovation’s analysis shows coal plants equipped with CCS are nearly three times more expensive than onshore wind power and more than twice as expensive as solar photovoltaics (PV). Although these costs will decline with research and development, the potential for cost improvement is limited. Coal with CCS will always need significant subsidies to complete economically with wind and solar. A CCS-equipped power plant burns carbon-based fuels (usually coal) and uses equipment to extract carbon dioxide (CO2) from the exhaust gases. In most instances, the CO2 then must be transported via pipeline for injection and storage underground, such as a depleted oil or gas field, a saline formation, or an unmineable coal seam. Once the storage site is full, the well must be sealed, and the area must be monitored for thousands of years to prevent the release of CO2. 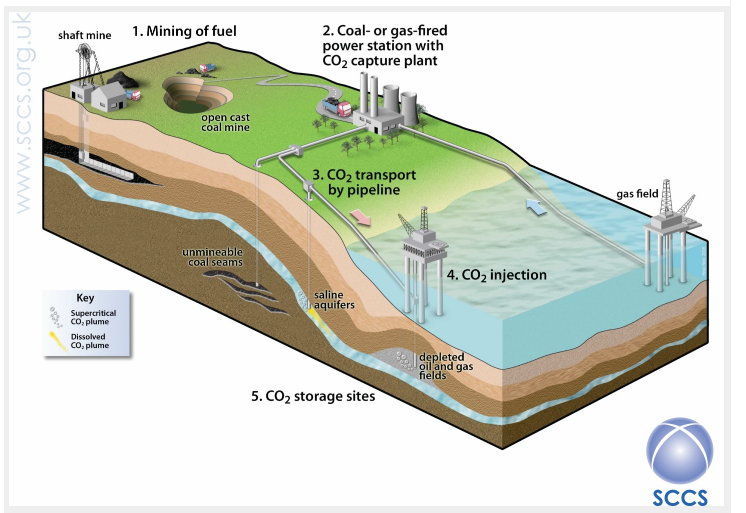 Diagram of CCS lifecycle, from coal mining through carbon storage. Although this diagram shows CO2 being stored under the sea floor, it may also be stored beneath land. Image from Scottish Carbon Capture and Storage (http://www.sccs.org.uk) used with permission. CCS is a favorite emissions reduction option for many politicians and coal companies because it does not involve transitioning to a different electricity source (such as wind, solar, or nuclear power). It holds out the promise that we can continue to burn fossil fuels, potentially in large quantities, without negative climate change impacts. Perhaps unsurprisingly, many of the world’s largest oil and gas companies recently invested $1 billion in CCS research. The largest problem facing CCS today is cost. In addition to the costs of an ordinary coal-fired power plant (which in the U.S. is already quite high, about $92 per megawatt-hour [MWh]), a coal plant with CCS requires additional equipment, increasing upfront construction costs, and has additional operations and maintenance (O&M) expenses. Since a considerable amount of energy is required to extract, pump, and compress CO2, a plant with CCS must also purchase and burn more fuel to produce the same amount of electricity as a plant without CCS. Additional costs come from building pipelines to transport the CO2, injecting it underground, and monitoring the injection site. We analyzed the cost of electricity for four types of power plants built in the U.S. in 2017: ultrasupercritical (modern) coal units, coal units that capture and store 90 percent of their CO2 emissions, onshore wind power, and utility-scale solar PV. We included capital, fuel, and O&M costs; the efficiencies (heat rates) of the coal plants; the plants’ capacity factors (what portion of the year they may generate power); construction time; financing costs (including inflation and interest rates); and depreciation. In the case of coal with CCS, we included the costs of CO2 transportation (assuming a 500 kilometer pipeline) and injection, as well as long-term monitoring. Government subsidies are not included for any of the technologies. Our full data sources (primarily the U.S. EIA and National Renewable Energy Laboratory), assumptions, and calculations are available online. Even without CCS, a new coal plant in the U.S. costs more than onshore wind and solar PV per unit of electricity it generates. Coal plants that capture and store 90 percent of their carbon emissions cost nearly two-thirds more than an equivalent coal plant without CCS to produce the same amount of electricity. A new solar PV or wind plant is between half and a third the price of a new coal unit with CCS and emits zero CO2. As a source of low-carbon power, CCS can’t compete on economics with wind and solar. Will CCS be competitive in the future? CCS is a new technology, and costs tend to fall as new technologies are deployed and develop. Could CCS become cost-competitive with onshore wind and solar PV thanks to research progress? The answer is no – the laws of physics limit CCS’ improvement potential. Extra energy is required to extract, compress, and pump the CO2. No matter how efficient CCS equipment becomes, it can never eliminate the need for extra energy to do extra work. Similarly, no matter how cheap CCS equipment becomes, it will never be free. CCS plants will always be more expensive to operate than regular coal plants, which are themselves more expensive than wind and solar. The prices in the table above assume that CCS plants will come in at forecasted costs, but CCS projects have so far been vastly over budget. For example, Southern Company’s Kemper plant was originally forecast to cost $2.2 billion, but after three years of delays and cost overruns, it now has an estimated price tag of $7.3 billion, and the plant’s coal gasifiers (which need years of additional work) may instead be scrapped. Similarly, the Illinois FutureGen project was ultimately abandoned due to cost and technology concerns, despite receiving $200 million in subsidies. Apart from CCS, coal power is a mature technology, and the costs of coal plants are not declining much in response to research. In contrast, solar PV and wind are already cheaper than new coal, and more cost declines are expected in the coming decade or so, as the technologies continue to mature. In the long term, even coal without CCS is unlikely to compete economically with wind and solar; it is extremely unlikely that coal with CCS will ever do so. Some advocates have proposed subsidizing CCS to help overcome its high costs. However, the subsidies required to put CCS on equal footing with wind or solar are staggering. Bringing CCS costs in line with solar costs today would require a roughly $80 per MWh subsidy, assuming CCS projects stay on-budget. By comparison, the production tax credit for wind plants, which were passed on a bipartisan basis in 2015, provide a subsidy of $23 per MWh and will sunset completely in 2020. The investment tax credit for solar plants pays for up to 30 percent of investment costs, or about $18 per MWh, and will decrease to 10 percent of investment costs by 2022. Although CCS is a poor option for decarbonizing the power sector, other roles may exist for CCS. For example, CO2 is a byproduct of cement manufacturing, and while some of these emissions can be eliminated through best practices, some emissions are unavoidable, at least with currently-available technologies. CCS may be the only option to eliminate CO2emissions from cement manufacturing and certain other industrial activities. While the industry sector might benefit from specific applications of CCS, most hopes for CCS, especially in the power sector, are misplaced. Other technologies, including renewables and energy efficiency, provide more emissions abatement at lower cost. If policymakers wish to provide electricity without artificial subsidies while protecting the climate, the answer is not CCS. Jeffrey Rissman is Head of Modeling & Energy Policy Expert at Energy Innovation. Robbie Orvis is Policy Design Projects Manager at the same organisation. Energy Innovation is a San Francisco-based energy and environmental policy think tank. This article was first published on our sister publication The Energy Collective and on Forbes.com and is republished here with permission. See also this article and the comments to it. The authors seem to connect CCS in the power sector to the construction of new coal fired power plants only. However, retrofitting existing coal fired power plant to reduce CO2 emission may become a must to achieve the goals of the Paris agreement on climate change. In addition it should be mentioned that natural gas is an important fossil fuel in the power sector too. Consequently, also the applications of CCS combined with gas fired power plants should be taken into account. Moreover it should be mentioned that, as a consequence of the Paris agreement, Negative Emissions Technologies (NETs) to remove CO2 will become very important. Biomass plants combined with CCS, for example in the power sector, are one of the NETs we should investigate and develop. Apart from these points, the outcome of system analyses on future power systems applying large amounts of renewable energy technologies like solar-PV and wind turbines suggest that gas fired power plants combined with CCS can become the most cost-effective option to balance the intermittency. See for example the study we did called ‘Least Cost Options for Integrating Intermittent Renewables in Low-Carbon Power Systems’, published in Applied Energy 161 (2016) 48-74. In our study we assumed that the natural gas infrastructure can and will be operated in a climate friendly manner. The conclusion must be that the general statement of the authors, that CCS is too expensive to reduce power sector emissions, is not justified by the arguments presented in the article. Also this statement is in contradiction with a range of scientific studies. Of course there are uncertainties regarding cost developments till 2030. Also comments can be given on assumptions made in this report. But these figures suggest that applying CCS in the power sector could be a cost effective option to achieve the required CO2 emission reduction in 2030. “Robert Murray is the CEO of Murray Energy, America’s largest privately owned coal-mining company. When someone who stands to make the most money off CCS says that it is a fraud I think we can safely assume CCS is a fraud.